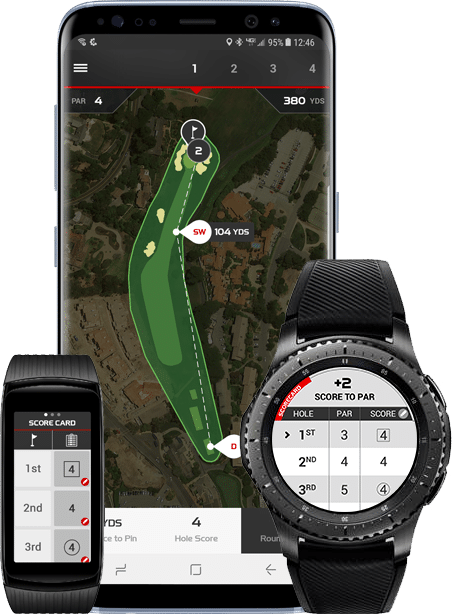 TaylorMade’s myRound Pro golf tracking GPS app is now compatible with Samsung’s latest Gear wearables, including the S3 and Fit2Pro fitness band. Smartwatch and sensory gadgets and smartphone apps have come a long way in helping golfers hone their skills. This includes anything from tiny sensors placed on gloves or clubs that analyse swings, to wearables that track how far the ball travels and how accurate the golfer is on the fairway. The popular myRoundPro app analyzes users statistics to provide detailed insights into the way they play. GPS functionality allows you to view front, middle and back yardages to each green on Samsung’s smartwatches and fitness bands. The app keeps records of your scores and you can review your shots later using a map on the phone. Users can also assign a club to each shot for more detailed analysis. Advanced performance statistics include strokes gained, proximity to the hole, golf club distance gaps, fairways hit, and greens in regulation. For now myRoundPro for Samsung’s smartwatches and fitness bands is only compatible with the Android version of the phone app.